Oscar Nominee! 4. Best Cinematography; Production Design; Costume Design; Original Score. 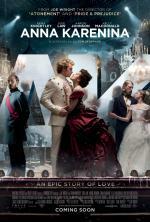 Director Joe Wright reteams with Keira Knightley for this version of Anna Karenina, which boasts a script by Tom Stoppard. Knightley stars as the title character, a Russian woman who cheats on her respected husband (Jude Law) with a young soldier (Aaron Johnson) and suffers greatly for her betrayal.